As North American households face heating bills averaging at least 30 % higher than last year; the connection between household energy use and energy prices is evident to everyone. Energy efficiency remains the quickest, cheapest, cleanest way to help you lower your home energy bills, extend the nation’s energy supplies, bring down energy costs and fatten your wallet. 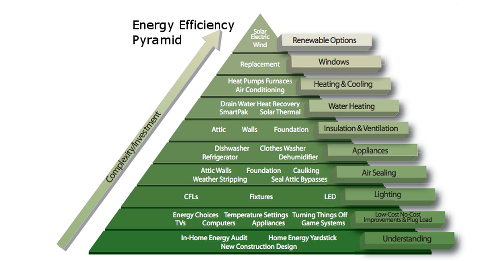 Energy efficiency shouldn’t be a headache – in fact, it can be very rewarding. Not only is increasing the energy efficiency of your home a step toward the better use of fuel and less pollution, but it also offers you greater security and independence, lower energy bills and makes your home a more comfortable place to live. Retrofitting energy efficiency can be expensive, but when you build a new house, it is relatively easy and cheap to make it energy efficient. The task is achieved by marrying several of the latest technologies and developments in home construction. The development and increasing use of Insulated Concrete Forms in construction is one of the main breakthroughs in high-energy efficiency in new homes. These “Forms” are Styrofoam (EPS) blocks that get filled with steel reinforced concrete and form the shape of the building. They double the insulation value, triple the sound resistance and quadruple the strength of the building. Another important component in energy efficient homes is Radiant Floor Heating; which the industry claims will alone save you 20% on your annual heating bill. Not to mention that it gives you unprecedented comfort during those cold and long winter nights. Add to this a High-Efficiency Tank-Less Water Heater that can heat your whole house while giving you an endless stream of hot water, and the picture gets a little clearer. Complete the package with a Heat Recovery Ventilator connected to a sophisticated “Earth Energy” system that uses a series of underground pipes to pre-condition the incoming air. This simple solution preheats your incoming air in the winter and pre-cools it in the summer. Combine this four energy efficient breakthroughs and the result is a home that will slash at least 50% of your home heating bills as well as be your castle in a very real sense of the word. The only question left to answer is how much does it all cost? Your initial investment for this type of home is a little more ( approximately 10% more compared to conventionally built home) or considerably less when you think of long term costs, not only for you and your family but also for the planet we live on. The “payback period” in fuel and maintenance would be between five to seven years but considering the alternative of keeping the status quo during predictions of a looming energy crisis; it is a very reasonable and logical solution. When buying your new home, consciously choose to make informed decisions concerning the future of you and your family. A little bit of effort and common sense can go a long way in making your home more energy efficient and paying you dividends for years to come.